Its peeling paint gleaming in the morning sun, the former Highland Park Sears Department Store exerts the commanding presence of its monolithic design. 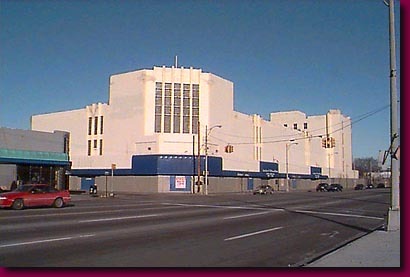 When the Highland Park Sears Department Store closed its doors in the late 1980's, it culminated a period of corporate disinvestment in the once prosperous Detroit enclave. Located across from the former Ford Headquarters Building on Woodward, the abandoned structures have become twin towers of corporate shame since both places had been essential to the future success of their companies. Currently the structure houses a religious organization's second hand store. Its future remains uncertain and it may be demolished to make way for expansion of the now prospering nearby Model T Plaza.